The Qasr al Hosn Festival was a ten-day community exhibition organized by the Abu Dhabi Tourism and Culture Authority and held at the site of fort Qasr al Hosn, the city’s oldest building. Celebrating the history of the fort—which was built in 1761 and later became the ancestral home of the ruling Al Nahyan family—and the heritage of the Emirates following from this iconic structure, the festival boasts many pieces of material culture: traditional objects, structures, foods, and animals. Perhaps the most prevalent, and the most puzzling, however, were the scores of people who have been appointed to work as the festival’s “cast.” While groups of festivalgoers wandered the old-timey souks, traced circles in the sand atop well-groomed horses and camels, and queued up for theatrical presentations, the cast of Qasr al Hosn performed. Some seemed in another world, focused solely on their handicrafts—among others, two men build a large dhow ship with resinous nails while a third carves palm wood into pieces for a smaller fishing boat; women in leather burkhas wove baskets and carpets with their skillful, henna-blackened fingers; and a group of fisherman sat in a circle, singing old Arabic sea shanties around a pile of wicker fishing nets. Not far away was a full bridal house, complete with a traditional Emirati “bride” and a gaggle of young bridesmaids, dancers with colorful dresses and hair that reached to the center of their backs. Young Emirati men, decked out in old policemen’s uniforms with heavy fake rifles and dusty brown keffiyeh, strolled the festival grounds. 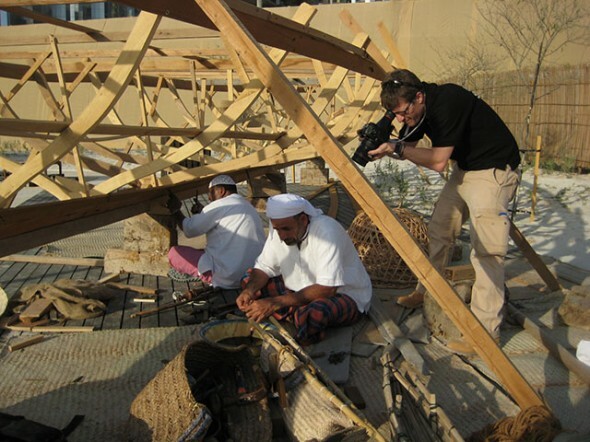 These cast members were consciously assembled, like objects in a museum, to both create and communicate a sense of Abu Dhabi’s material cultural heritage, grown from the white washed walls of the old stone fort. Part of this distinction between person and object—even human “objects”—has to do with the other roles that people fulfill at the festival. Not everyone became an object. Each participant wore an identification tag with one of three distinctions—“Volunteer,” “Event Staff,” or “Cast.” While the cast was responsible for representing traditions of Emirati culture through certain kinds of performance (weaving, singing, crafting, storytelling, simply looking traditional), it was the staff and volunteers who interacted with the festival’s ticketholders. As I entered the festival, I was soon greeted by a young Emirati teen with a red and green armband from Takatof, a volunteer organization in the UAE. This young man, and later a group of knowledgeable high school–age Emirati girls, showed me around the various stalls, booths, and craft areas, explaining each tableau we approached—who the people inside were, what they were doing or making, and how the objects around them functioned. Contributing to the need for mediation was the language barrier; if I spoke Arabic, I would have been able to understand the stories of the old marine storyteller. But as festival photographers snapped shots of men playing the rababa or building a dhow ship, it was easy to see that these performers were aware of their role as a spectacle of national tradition. Emphasizing this fact were the QR codes placed next to each “scene,” giving smart phone users easy access to these explanations without human contact—in most cases, one was not even required to step inside a building, much less speak to the people inside the tableaux. It was as if observers were expected to treat the cast merely as pieces in a museum, and each exhibit was carefully crafted to put us in the position of passive observers. 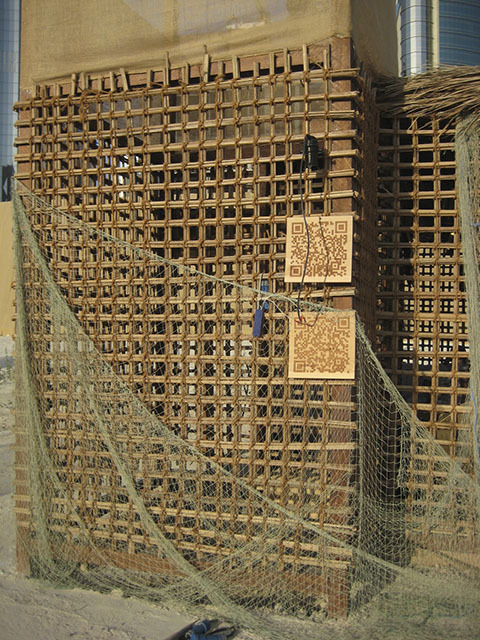 Some cast members were hired because of the skills they have—skills that were once an integral part of Emirati life and are now regarded as “artifacts.” The elderly fishermen, for example, weaving fishnets and drying fish in the marine area of the festival, once fed the Emirati community, and now they are “objects” used to demonstrate a historic method of subsistence. As we passed through the souk area, I saw plastic packets of dried fish at one booth, sold by a fresh-faced young Emirati man in national dress. The dried fish was once a staple of the Emirati diet, the souk vendor told me, explaining the various types of fish and their prices. As such, the fishermen would have been active participants in the economy of everyday food production. Now these men only represent daily life; they illustrate elements of Emirati culture that the Emirati girls who showed me around have never experienced. At another booth, vendors sold brightly colored woven cell phone covers. These, I saw later, were also created at the festival, this time by women weaving on a traditional loom. The fishermen and weavers were carefully chosen aspects of the past that my Emirati guides don’t actually remember—their daily lives are presumably not “traditional” enough to be displayed at the festival. So these products, the dried fish and iPhone accouterments, are tools used to remember the past while also repackaging it—literally—to serve the interests of the present. The traditional Emirati policeman was another kind of human object. Unlike most of the other cast members, these men were mobile, found not only near the model of the police station, but also wandering the festival areas, fake rifles slung across their khaki-clad shoulders. Their minty green and dark maroon Land Rovers were interspersed throughout the heritage site in every area but the marine section, reminding us that the Qasr al Hosn was initially a watchtower and a fortress. The old-style policemen were not too far removed from today’s policemen, and while I don’t think these actors were cast to actually police the festival, they function as crowd control simply by playing the part. By patrolling the festival like policemen would have done, and by placing their trucks in the midst of the crowds, these “police” became objects that both represented order and created order. Just the presence of these men as objects was enough to create a sense of culture that not only represents what is historical, but reinforces present structures. Using these people—the cast—as objects of material culture helps to serve the interests of the present but may also distort the image of a not so distant past. Actors in other historical reenactments—like Fort Ticonderoga, Jamestown, or Gettysburg, in the United States—are employed to make history come alive for a population that has no first-hand memory or experience of it. Visitors are led among historic rooms containing historic chairs upholstered with historic fabrics, encouraged to try their hand at historic techniques like churning butter, and entertained by performances of historic practices or events. It’s fun to plunge into the past, drawing parallels and comparisons between your life and the ones enacted by the cast with the knowledge that, unlike the American settlers, you can drive home in an air-conditioned car. In contrast, objects at the Qasr al Hosn festival were presented as “historic,” but the history in this case is so recent that it has living subjects—some of the festival’s fishermen are actually fishermen, rababa players actually play the rababa, and traditional coffee is still drunk from traditional coffee pots. This presentation of history, still remembered by some, is different than a 2013 reenactment of the American Revolution because here in Abu Dhabi, we are not looking at the past from a vantage point 250 years in the future. The people and practices showcased at the festival are part of the Emirati heritage, and part of a culture that can not and should not yet be relegated to a dusty box in the attic, or the quaint observations of the historically minded tourist. The Qasr festival put people on display to offer snapshots of a not-too-distant history and remind us of the need to remember the roots of a culture. In doing so, however, it raises the question: do these human “heritage objects” bring the past closer to us, or push it further away?